The American-made William Henry B12 Atlas Spearpoint combines superior materials, design, and functionality for maximum durability and elegance. 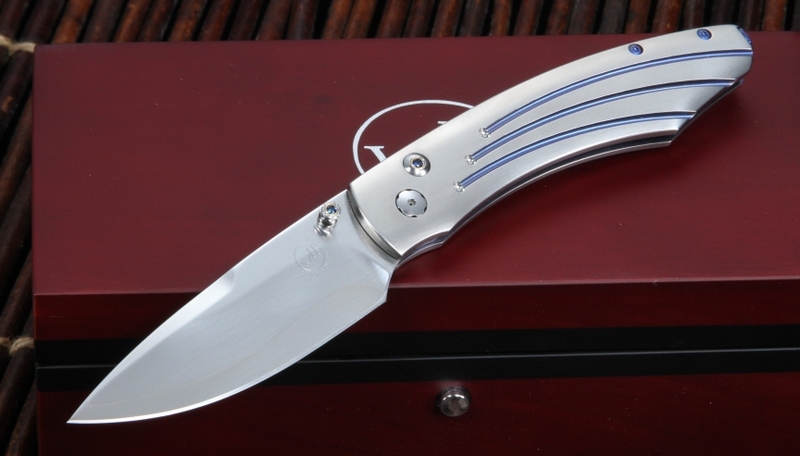 By incorporating superior function with superior art, William Henry has crafted a knife meeting all the technical specifications of a high-quality cutting tool while also providing personality and aesthetic charm. The extra-strong ZDP-189 stainless steel, deep-belly hollow ground blade ensures excellent edge retention and even cutting the toughest of materials. With a 3.06" (77.7 mm) blade length, a 4.13" (104.95 mm) handle length, and an overall open length of 7.19" (182.6 mm), the Atlas B12 is lightweight and agile but still long enough for a firm grip in your hand. 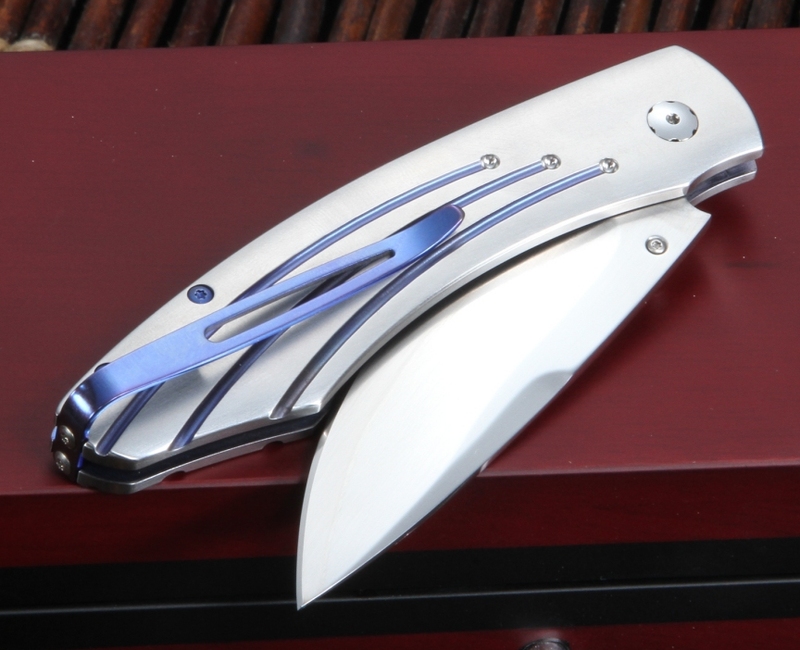 The aerospace grade titanium frame provides a sturdy structure for the knife and the titanium clip ensures the knife stays safe and secure when resting at your side. With a one-hand button lock system, the Atlas B12 is nevertheless always ready for the next challenge through effortless and rapid opening. However, the design of the Atlas B12 includes more than just functionality; kashmir blue topaz sets the one-hand button lock and the thumb stud. The electric blue anodized titanium clip and handle groves incorporate aesthetic depth to the knife's functional design, and the hand satin finish of both the blade and handle ties together the knife's stunning modern aesthetic. As a finishing touch, the William Henry knife comes in an attractive wood presentation box with a certificate of authenticity which enhances the finesse and credibility of the Atlas B12. If looking for a strong and sleek knife, the Atlas B12 perfectly combines modern, thoughtful design with durable, powerful materials to form a knife with both point and personality. Order from KnifeArt and your William Henry knife will be delivered with no shipping charges, and your order will be fulfilled within one business day of being placed. Customer satisfaction of the Atlas Spearpoint folder is guaranteed. I've had this knife for two days. Is it worth the price? For me it is. The action is smooth--tight but smooth. The tension holding the blade closed is adequate for me. It feels like a safe, functional knife. The button lock feels positive. The ergonomics are great. The aesthetics are great. There are no sharp edges except for the blade edge, and the blade edge came paper-cutting sharp. The bevels are uniform. In my opinion, ZDP-189 can't match the sharpness of carbon steels like L6, O1, or 1095, but with a (presumed) RC hardness of 67, time will tell if I can coax out more sharpness over time. The blade geometry provides an excellent platform for an excellent cutter should you ever decide to actually use this beautiful tool. Suffice it to say, ZDP-189 is a top notch steel, and the knife came out of the box impressively sharp. It should stay that way for a long time if the knife is used as intended. The weight came in at 2.3 ounces on my digital scale. The length of the blade is just under three inches, which provides a small comfort zone on three inch or less carry restrictions. I like the knife enough that I plan on getting a B30-Saturn. 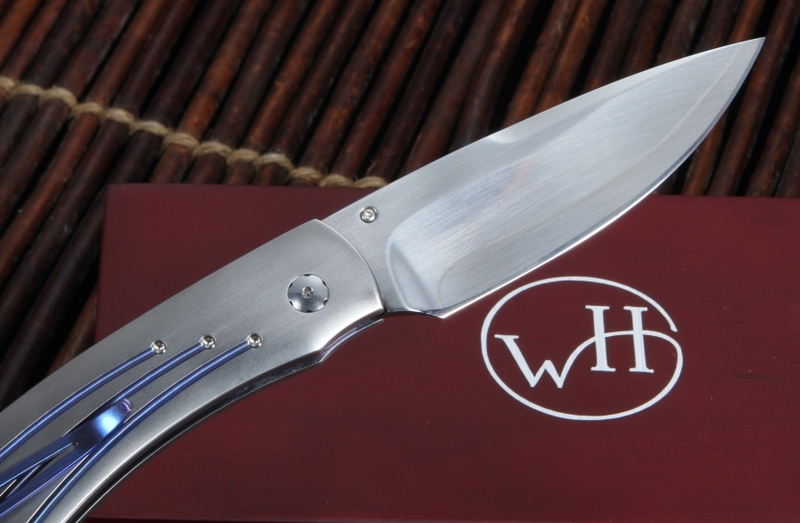 In my opinion, William Henry (WH) knives are a different breed from other flippers. It's not an apples to apples comparison. WH claims that you are paying for materials, attention to detail, and finish. From my perspective, that appears to be right. For me, WH knifes are in a class of their own, including the “economy” ones. If you want what they are offering, I don't know where else you can get it. For me, buying this B12 Atlas is like buying one of the least expensive houses in a very expensive neighborhood. Not a bad place to live.